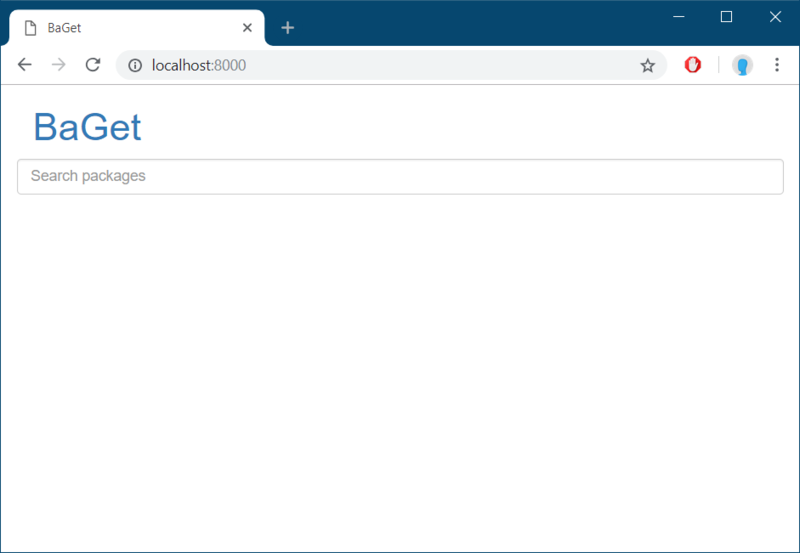 The official NuGet.Server package which helps you to run NuGet feeds locally which is not cross platform, so I was looking for some other package and I found BaGet, it is a NuGet server implementation on .NET Core. So you can use the ASP.NET Core runtime as the base image, install the server and run the app. Here is the DockerFile. First I am using ASP.NET Core runtime as the base image, installing the wget and unzip utilities. Then I am downloading the BaGet zip from the releases. Since I want to run the server in port 8000, I am setting the ASPNETCORE_URLS environment variable. The ApiKeyHash environment variable is used by BaGet as the API Key for NuGet publishing. It is a SHA256 encrypted value for NUGET-SERVER-API-KEY. You can build the container using docker build command, and run it using docker run command - docker run -d -p 8000:8000 --name nugetserver anuraj/baget:latest. Once it is running, you can access it using http://localhost:8000. And you can update your nuget.config in Visual Studio, Tools > NuGet Package Manager > Package Manager Settings. And select the Package sources and add your URL and name.